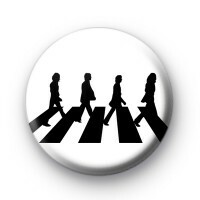 A black and white badge inspired by The Beatles crossing at Abbey Road. Basic black and white silouette badge, perfect for lovers of the fab four. Standard 25mm button badge composed of metal badge parts and a copper pin back.